One thing about the English Martha is that it includes a ballet that is not present in the other sets. However, they put the ballet in place of a dancing scene where Nancy and Martha are trying to teach Tristan to dance so he can come to the fair with them. Last edited by Fritz Kobus; Jun-29-2018 at 17:43. Hey nice. The forum software didn't blank out the word bastardized. That's a shame. I love De los Angeles, but I'm not enough of a fan of Martha to get a bad English version of it. It's on You Tube, probably every track. Check it out and see how you like it, at least the De los Angeles tracks. I may be being too harsh in my judgement of it. After all, I am just a novice. Last edited by Fritz Kobus; Jun-29-2018 at 23:56. I will be very curious to hear your thoughts on the new Martha. For some reason it is not clicking with me. The orchestra is magnificently conducted and sounds phenominal, but the singing seem to be lacking something. I think that the singers maybe are trying too hard and it shows, or they are just not emotionally involved--that is to say they have not become the characters they are portraying. Lionel seems rather unengaged. Lady Harriett's voice is too dark for this role IMO, albeit a wonderful voice otherwise. I want to update my post as I think I figured out my problem. With further listening I think the bolded comments above are too harsh. It is a good recording and a pleasure to listen to, just somehow I think I had set my expectations way too high. I do think that the Lucia Popp/ Siegfried Jerusalem set will remain my favorite of all Martha recordings though. then scroll down until you see the yellow covers (NAXOS posted it). "I think that the singers maybe are trying too hard and it shows, or they are just not emotionally involved--that is to say they have not become the characters they are portraying." I think the problem here is I don't care for the tenor's voice. The one in the video above is so much better to my ear, not that this "Lionel seems rather unengaged." "Lady Harriett's voice is too dark for this role." Last edited by Fritz Kobus; Jun-29-2018 at 23:55. It might be similar to how Cecilia Bartoli in La Sonnambula is wonderful, but it is not my favorite La Sonnambula as I prefer a soprano in that role. Here, as much as I like the soprano's voice, I would prefer a brighter soprano voice in the role of Lady Harriet. ...the story of bored Lady Harriet Durham and her friend Nancy, who, as Martha and Juliet, head to Richmond's grocery store to find not only employment, but true love as well. 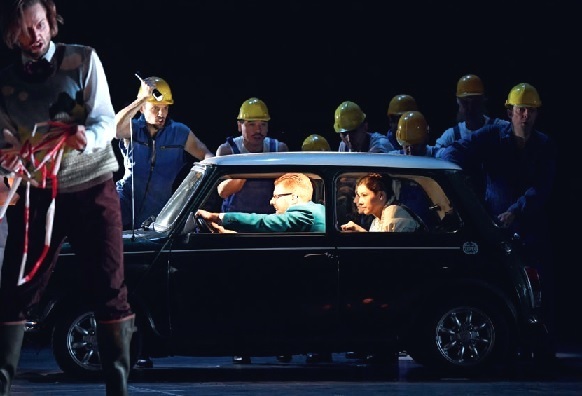 Plunkett in a kilt, choristers in hard hats, and two of the principals driving around in a car. So how can they put out a serious sound recording of a traditional Martha when they are acting out a goof ball Regie version? I think a major problem may be that the goofiness of this production comes through in the sound recording just enough to detract from the true beauty of this opera. As I stated initially, some parts just don't seem as beautiful in this production as in the other recordings. This is probably the first recording that was not made from a traditional performance. Last edited by Fritz Kobus; Jul-04-2018 at 22:26. The reason for the issue of the discs is that it is apparently the only recording of the title role by Victoria de los Angeles. She is indeed its great glory, singing with a sense of style and a beauty of tone and phrasing that is certainly worth hearing. Unfortunately the diction of most of the singers enables much of it to be heard. When all of this is taken together with a recording which is at best dim and often worse, and prone to changes of pitch in held notes, it is clear that you would have to be a very fervent admirer of de los Angeles to buy this set. When I listen to her singing I think that I might be inclined to join them, but should warn that a strong stomach is needed for much of the rest. Last edited by Fritz Kobus; Jul-07-2018 at 06:43. Found another review of the new Martha CD set (here it is translated to English). In the staging of Katharina Thoma the story remained neatly intact. She released the piece as a nineteenth-century romcom, in the feel-good style of films like Pretty Woman and You've got mail . The whole breathed the vitality of a modern musical and managed to generate sentimental emotion at the appropriate moments. A comical note was the deliberately rather strikingly displayed gender changes during the Richmond Fair. The bold part explains something I noticed on the CD. Molly Pitt's voice sounded like it was from a Monty Python skit with a man singing a woman's part in a false higher voice. So now I know. Een komische noot vormden de opzettelijk nogal opvallend weergegeven genderwisselingen tijdens de Richmond Fair. De Amerikaanse tenor AJ Glueckert deed als Lionel niet onder voor zijn tegenspeelster Bengtsson. Zijn vertolking van ‘Ach, so fromm’ zorgde bij mij voor heuse ontroering. Last edited by Fritz Kobus; Jul-08-2018 at 05:46. They say knowledge is power. So I took action! Fixed it. Now the Molly Pitt from the Lucia Popp set is in place of this man pretending to sing like a woman. Much nicer and it is seamless. Nobody would guess from just listening to it. Thank you Audacity music editor! Last edited by Fritz Kobus; Jul-08-2018 at 17:55. Found an awesome Martha recording from 1927 (sound sample on OperaPassion site) but the streaming links are apparently broken. This is a transfer from shellac recordings. Site. The new Martha set is reviewed in the July-August, 2018, issue of Opernglas (https://www.opernglas.de/) (see quoted review below). Finally, after seeing nothing but glowing reviews, my reservations with this set are vindicated. Every underlined part in the quote below is pretty much my impressions and I have listened to this set at least a dozen times. I noted Lady Harriet is a dark soprano and while I like that type of soprano, I don't find it the best fit for Lady Harriet. But I did not feel she sang as beautifully as the Harriets in the other sets as noted here she was not quite making the arias with the greatest of ease. Lionel's voice did not appeal to me. I don't know if I would call it nasal, but it seems to lack a richness that is present with Wunderlich and Rüdiger Wohlers (in both German television productions). The orchestral part is where this recording really shines. I would rate this the best Martha on CD orchestrally, but for singing and for overall production I am sticking with the Lucia Popp/Siegfried Jerusalem set. Cast: Maria Bengtsson, Katharina Magiera, Barnaby Rea, A. J. Glueckert, Björn Bürger, et. al. Since its world premiere in November, 1847, at Vienna’s Kärntnertor Theater, Flotow’s opera has enjoyed undiminished popularity. One really detects the audience’s enthusiasm while listening to this 2016 live performance from the Frankfurt Opera . . . and a lot of stage noise and extraneous sounds from time to time, as well. (Actually performances – the disc is a combination of “takes” from several performances from that October.) Maria Bengtsson sings the capricious Lady Harriet Durham with a dark soprano, but lacks the ease that’s indispensable for the character’s sometimes very demanding arias. As Her Ladyship’s confidante Nancy, mezzo Katharina Magiera makes a more favorable impression, and is enchanting in the third act hunting scene with her saucy clowning. Barnaby Rea is entirely credible vocally (if not accent-free) as Sir Tristan Mickleford, the middle-aged prig who is cajoled by the bored ladies into joining their masquerade at the Richmond Fair. A. J. Glueckert (Lyonel) has a nasal tenor that sounded somewhat strained at the time of the recording, but Björn Bürger is vocally and dramatically winning as Lyonel’s foster brother Plunkett. In the beginning, the five are lacking spontaneity and vitality in the ensemble scenes, but fortunately, things improve over the course of the performance. Sebastian Weigle elicits wonderfully organic sound from the Frankfurt Opera and Museum Orchestra. The sparkling, imaginative motifs and folksong-like melodies with some British color are superbly drawn out of the score, and the singers receive accomplished support from the pit. Last edited by Fritz Kobus; Jul-11-2018 at 13:04. Live performance that the new Martha CD set was recorded from. Cheerleaders (and male?) in Flotow's Martha? If DVD is issued--NOT! I just saved $30 if a DVD is issued. Last edited by Fritz Kobus; Jul-12-2018 at 13:38. Last edited by Fritz Kobus; Sep-07-2018 at 03:03. There is a Martha on film featuring Waltraud Meier as Nancy and Krisztina Laki as Lady Harriet. Here is a video clip with Rüdiger Wohlers as Lyonel. A very young Waltrud sings a short bit with Kriwsztina at 9:29 at a short verse at 10:21. Last edited by Fritz Kobus; Jan-19-2019 at 06:01. Another clip from my favorite Martha on film. This one also features Rudiger Wohlers. Last edited by Fritz Kobus; Jan-19-2019 at 06:03. Martha Argerich: Love her or Hate her? All times are GMT +1. The current date and time is Apr-25-2019 16:59.